For those businesses wanting to improve on their supply chain planning processes, implementing the APO SNP Optimiser can often appear to be a daunting task. End-to-end supply chains and resulting SNP Optimiser implementations are becoming increasingly complex. The decision to utilise the SNP optimiser is usually aligned with the requirement to plan a realistic, constrained plan with multiple alternative solution options within the constraints and across the whole supply chain. Choosing which planning method to use the SNP optimiser is undoubtedly the most capable of modelling and dealing with complex planning scenarios. The prospect of determining and managing all of the dependent costs in the supply chain may lead an organisation to opt out of using the SNP Optimiser. Heuristics or CTM are clear rules based algorithms and therefore easier to use and understand, however, they also tend not to properly reflect a complex and constrained supply chain, and thus the value proposition of the APO implementation can be diminished. Planning with the SNP Optimiser need not be as onerous as is often assumed. Having worked extensively with the SNP Optimiser for over 12 years, I have developed an approach based on a number of pragmatic steps that can be applied to tame the beast. This article will highlight options available to manage the SNP optimiser in such a way that it becomes manageable and user friendly. It will take you through some of the steps taken to Optimise the Optimiser at various large multinational multi-brand organisations. Any implementation must start with high-level planning scenario design, which clearly details the various planning scenarios describing at a functional level how product is planned with respect to production and distribution across the network. For this, we develop a rule book, holding between 10-30 planning scenarios, which will be the planning benchmark and will become the cornerstone for the entire APO SNP implementation. From the Planning Rule book we look to identify which costs are relevant and how they should be stacked against each other to ensure the right planning results. So for each planning scenario, we would look to specify the optimiser costs settings for all the cost types. By defining default values based on product or location characteristics the complexity of the cost model can be massively reduced. As part of the implementation we always aim to ensure that users do not need to maintain any of the cost master data directly. This should be pre-defined based on the cost determined in the cost model and the rule book. The cost automation can be managed through mass management of master data so that planners can now focus on the planning results instead of constantly worrying about the correctness of the master data for new location products. The bigger the supply chain the longer the optimiser run and the more complex the solve. Performance can be crippling, a pragmatic approach is required to ensure run time and solution quality remain under control. The way to manage this is to simplify the model. This can be achieved by breaking up the optimiser runs into as many independent supply chains as possible. 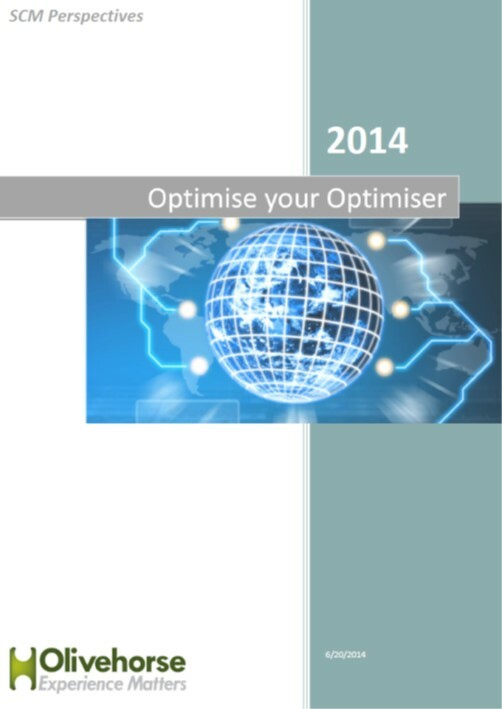 The optimiser is an extremely versatile planning tool. If managed properly, it can cope with more sophisticated planning scenarios and will deliver more realistic planning results in comparison to Heuristics and CTM. This will ultimately deliver the value of the APO implementation through improved service levels and appropriate stock holding. With all the different types of costs the solution permutations are endless. At Olivehorse, we have extensive experience at implementing the SNP Optimiser for some of the largest global supply chains. In addition we have designed and built many functional custom solutions to suit the various non SAP standard business scenarios of our clients. As many of our clients face similar problems, we have been able to develop a suite of optimiser solutions that can be tailored to allow a rapid implementation of sophisticated planning tools, which are only available through custom development of the Optimiser Input and Results Logs. The SNP Optimiser is the most versatile Supply Chain planning solution offered by SAP APO. The road to implementing the SNP optimiser can be as complex or as simple as your business requirements demand. Taking the right approach can makes all the difference to the user experience and efficiency, cost and speed of implementation. The task can appear daunting. However large organisations with complex supply chains have followed this approach and are rewarded with a superior planning tool, which is fit for use for their user community and tailored to their supply chain goals. Click below to download our whitepaper and learn more of the options available to manage the Optimiser in such a way that it becomes manageable and user friendly. The author, Rick Lambrecht, is Lead in Supply Chain Optimisation at Olivehorse, specialists in development and delivery of supply chain solutions based on SAP SCM.